TAMPA, Fla. — There is so much to do and see at this year's Florida State Fair. With carnival games, rides, and of course so much unique food, there is plenty to check out at the fair. One of the highlights of any fair experience is definitely the performances. Bello Nock is performing every day of the fair. His circus act is full of tricks and stunts including a human canon shot, over a rotating helicopter blade. But for Nock, it is the location of his show, not his stunts, that really matter. "It's been awesome. This is my first time performing at the Florida State Fair," Nock said. "And I gotta tell you, I live in this area, and I travel all over the world performing for Moscow, Australia, I can't even name it. Last year I was in 22 countries, all around the world, and there's nothing like working for your hometown crowd." The Moto Maniacs really wowed the audience with their stunts this weekend. A giant ramp allowed for some epic jumps. But the stunt that really got the crowd going was when one, then two, then three riders brought their bikes into the metal globe and rode around. A Tampa family with four little kids looked on and couldn't help but make exclamations of awe. "I had no idea motorcycles could do that." 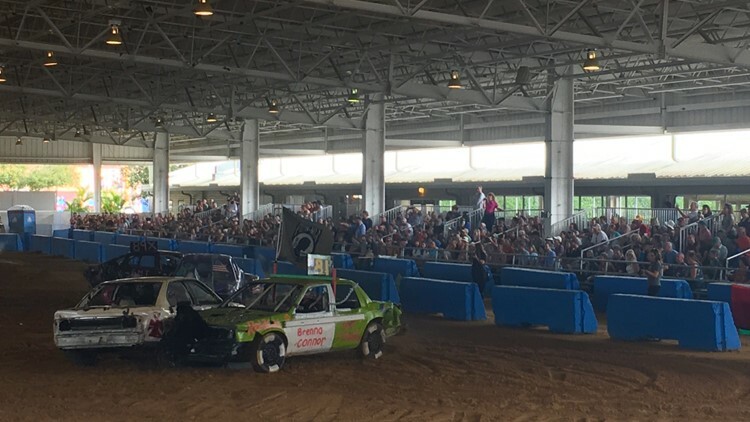 The Sunday special was the Demolition Derby show. This weekend-only event packed the Bob Thomas Equestrian Center. Everyone wanted to see these Florida drivers ram into one another. One driver who crushed the competition in the first two events was also one of the only two women competing today. "To see the little kids faces, and they just light up with joy when they see us doing this. And then they find out I am a female, and they just love it. I do it strictly for the fans," said demolition driver Skylar Graves.